There are times when Julien Jamar enters a different world. When she does, her husband, Jason, will start to ask her a question, see the look in her eyes, and realize it’s pointless at the moment. Those jumps into another realm serve Jamar well. In fact, you might say she makes a living with these flights of fantasy. Jamar is the author of the “Chronicles of Lashai,” a trilogy featuring the characters Elian and Cassai. 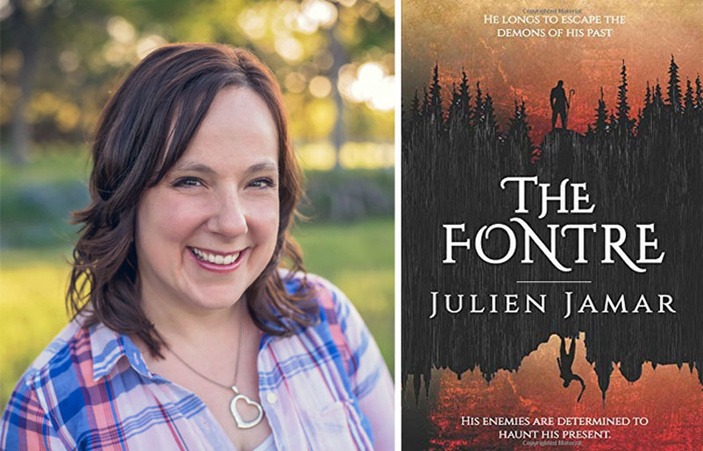 On Saturday, Feb. 9, she’s celebrating the second book in the series, “The Fontre,” with a release party from 10:30 a.m.-1 p.m. at Numinous Coffee Roasters, 715 RR 1431 in Marble Falls. “I’m so excited to get it into readers’ hands,” the Highland Lakes author said. The book picks up where the first one, “The Namarielle,” left off. While “The Namarielle” was more Cassai’s story, the second is about close friend Elian. “The Namarielle” is available on Amazon if you need to catch up. “What if there were two characters who loved each other so much that when one got hurt, the other felt it,” Jamar said. That seed planted itself in Jamar’s mind, where it grew. Many people have an idea they think would make a good story, but it never moves beyond that. And it might seem like that was where Jamar’s writing career was since the initial idea took root almost 30 years ago. Jamar, however, wrote her first novel, a 110-pager, when she was 10 years old. “It was trash,” she said regarding the quality of the novel. While it wasn’t any good by her standards, it did do something. “It showed me I could sit down and write a book myself,” she said. People who want to write a book or do something else creative often stop before they even begin, simply from self-doubt. “We put so many mental hurdles on ourselves as adults because we put them in front of us, or allow other people to put them in front of us,” she said. The key is to just write (or do whatever your creative outlet is). Jamar began focusing on her writing about the time she turned 20. While she worked on her writing, the stories that would become the “Chronicles of Lashai” took shape. She was 35 when she finally wrote “The Namarielle,” but even before she began the first book of the trilogy, Jamar had the complete story, from Book One through Book Three, laid out in her mind. “The Namarielle” found an audience. It’s a young adult novel, as is “The Fontre,” but the story clicked with people of all ages, though Jamar recommends it for kids 13 and older. She picks up the story in “The Fontre.” Elian must elicit help from the queen of the fairies to help rescue Cassai from his twin brother. But to do it, he must make a promise to the queen that could change his life forever. While it is a fantasy novel, readers find the characters very relatable. That’s one of the keys to Jamar’s novels: writing characters who come to life for the readers. It allows the reader to join Cassai and Elian on their adventure. If you’re interested in a good adventure, stop by Numinous on Saturday and visit with Jamar. She’ll be glad to introduce you to Elian, Cassai, and a whole world of characters. Go to julienjamar.com for more information.